Everyday Albums is a series of album reviews wherein the album could be listened to everyday. This series will examine the best of those from 2010. 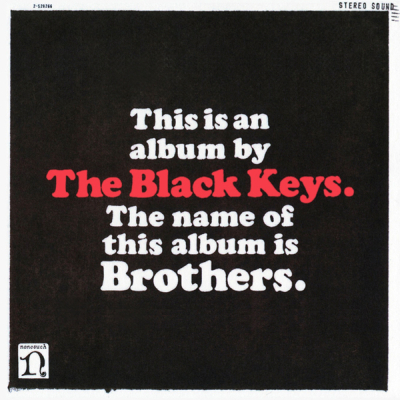 While The Black Keys broke onto the scene years ago, their 2010 release Brothers is certainly a breakthrough on several levels. It’s hard to look anywhere these days without seeing The Black Keys. Unlike their previous music, Brothers went beyond the two-piece band for much of the album. The album kicks off with “Everlasting Light” which sets the tone. It has a driving beat and impressive falsetto from Dan Auerbach. “Next Girl” keeps the momentum going with more of a drums + fuzz feel that The Black Keys are known for…and a SINGING DINOSAUR! “Tighten Up” has been heard in all sorts of things from TV shows to TV spots. It’s catchy, has some meat to it, and Patrick Carney gets his chance to beat those drums. With songs like the swampy “Too Afraid to Love You” and the crunchy (and my favorite track on the album) “Sinister Kid” the album is full of gems and will be a staple of my iPod for years to come. It’s definitely worth picking up, and for you mainstreamers, The Black Keys were named Artist of the Year by Spin Magazine and Rolling Stone put Brothers as the #2 best album in 2010 (right behind Kanye West…). Buy it at Amazon it’s well worth it!